This entry originally appeared on NEHW member Craig D.B. Patton’s blog. Revising vs. redrafting. Tinkering with what you wrote the first time vs. tossing all of it in the (virtual) bin because you realize you just plain whiffed on the first attempt. I think I’ve had a habit of resisting the latter. It’s harder, emotionally, for me to accept the fact that I invested time and energy and didn’t actually create something worth keeping. 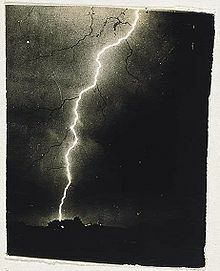 I like it much better when the lightning bolt flies straight and true and fries something with a really solid BOOM! But it doesn’t always. And I’ve missed enough times now to be better at recognizing and accepting it. It’s also become one of the times when I remember what bands go through in the studio. I’ve never been in a band, but I’ve read enough articles and books to have a sense of how some of them work and how bumpy and long and curving the road to creating some of my favorite music was. Take after take after take. Experiment after experiment that seems great conceptually and then just lies there on the floor when tried. Songs that have no chorus. Choruses that have no verses. Bits of instrumentation that don’t work until combined, which happens sometimes by design and sometimes accidentally. Hours and hours of horrible music before the good stuff arrives, if it does at all. But the seed idea, if it’s good enough, survives through all that. Which is the same with stories. A good idea is a good idea. The problems come when trying to tell the story. And sometimes it takes a while. I have a song/story like that now. The first take/draft was fun while I was doing it. There are some good images and moments, particularly in the second half of it. But it wound up…meh. And meh doesn’t get fixed by cutting a few paragraphs and rewriting a few more. So I’ve marched back into the studio. Changed a few effects pedals. Reworked some instrumentation. The red light is on.